Intona Technology is a German team specialising in signal processing devices for professional applications. Their new product - claimed to be a world first - is designed to galvanically isolate the USB 2.0 Hi-Speed bus. Its insertion in a data line will break ground loops, avoid noise coupling, and protect ports from power surges and voltage spikes, in applications which require high speed USB signal transfers. But what is a galvanic isolator? Galvanic isolation is a design technique that separates electrical circuits to eliminate stray currents. Signals can pass between galvanically isolated circuits, but stray currents, such as differences in ground potential or currents induced by AC power, are blocked. Galvanic isolation is a principle of isolating functional sections of electrical systems to prevent current flow, so that there are no direct conduction paths. Energy or information can still be exchanged between the sections by other means, such as capacitance, induction or electromagnetic waves, or by optical, acoustic, or mechanical means. Generally referred to as “isolation”, galvanic isolation is the convention used whereby individual parts of the electrical system may possess different ground potentials. The two most common reasons for creating isolation are safety from fault conditions in industrial grade products and where wired communication between devices is needed but each device regulates its own power. 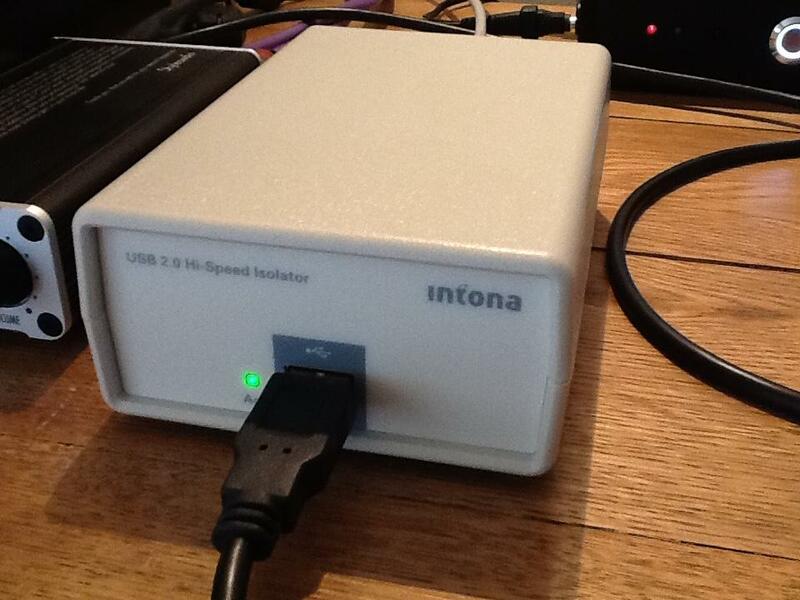 The Intona USB Hi-Speed Isolator is the antithesis of glitzy packaging. I received the Industrial version, and industrial it looks - a scientific instrument ready for the lab or workshop. It’s appearance is a quaint-Iooking anachronistic throwback to diy/technician projects. This is no esoteric artistic expression - there are no pretensions of a beautiful case concealing cheap and simple circuitry. I would guess that the internal parts of this unit are ‘military’ standard quality and assembly, built to do the job correctly, reliably, and even indefinitely. In it’s somewhat sombre yet tidy smooth ABS plastic IP54 case with gold-plated USB sockets, the isolator will look quite out of place on the audiophile’s exotic timber rack, especially with front as well as rear cable connection, so what would motivate placing one in your system? Indeed, is this even a hifi product at all? A look at the sparse functional website reveals that “audiophile” is listed sixth among several applications, and yet drilling down through a few links shows that the product is indeed intended for home digital audio system improvement. So why add this unit to your home audio system? I tried to answer this by paraphrasing and summarising some answers from the FAQ section of the website. Firstly, installation is simple, just connect in the USB line from source to DAC, since the isolator is transparent to host and device (and connects with USB A and B plugs), ultra-quiet, and powered by the USB bus, so a separate power supply is not needed. Does the isolator improve the sound quality? It completely isolates data and power lines, and in an audio application, the resulting sound quality improvement is the effect of breaking the path of all the noise coming from the host computer. User comments, I am told, are that the Industrial version is vastly superior sounding to the Standard version, and this may be attributed to the superior components used in the Industrial version. This product is designed for the lowest noise possible in the 20 Hz - 20 kHz range and perfect signal integrity. The 7054-based USB Hi-Speed Isolator is a phy-level receiver, isolator, reclocker, re-packetiser working at a bidirectional bandwidth of 480 MBit/s. It does not translate or distort data packets like a hub, but reproduces and re-clocks the original data by 100%. By using a technology well known in digital communication systems called Spread Spectrum, any harmonics produced through periodic packet transmission (e.g. 8 kHz packet noise) is eliminated. That little part of my rational brain reserved for understanding audio electronics thought that the technical explanation was sensible, but what would my music ears tell me? Arriving in just five days by always-efficient UPS from Senden (near Münster) in Germany to New Zealand, out of the small box came the small and lightweight unit, just 135 x 90 x 45 mm and 150 g. Included in the box is a small sheet carrying the declaration of conformity and the URL for the “user manual” download, which turns out to be a simple datasheet, with no operating instructions. Of course, it needs only to be placed in the signal line from the PC to the DAC, requiring an additional USB cable (which is not provided with the unit). So after removing the USB Disruptor which I have become very accustomed to using (see my earlier review), I connected the USB Isolator between my SONY Vaio E Series laptop running JRiver MC21 and Fidelizer 7.1, and my Cambridge DacMagic, and clicked play on a favourite FLAC file album. I was curious to see if the enhancing effect was comparable with that accomplished by the USB Disruptor, especially given the very different costs of the two units. The green lights blinked, but no sound came forth! Had I connected the USB Isolator the correct way? The two sockets are labelled “host” and “device”. My logic was that the host is the PC and the device is that which is attached, i.e. the DAC. This seemed borne out by the datasheet which states that the unit is powered by the host, i.e. the PC. And, of course, the cables have specific plugs for particular sockets. Wouldn’t Windows 10 just recognise the USB Isolator as a new device? I tried again, and this time my music played through the USB Isolator when I selected a WASAPI output from the Media Center playback options (I normally drive a SoTM interface with ASIO output). This must be done manually, as the USB Isolator is transparent to the PC, i.e. is not auto-detected. Everything sounded just fine, and I enjoyed some music for a few hours. After a few albums, I took the USB Isolator out of the system, playing my music directly from PC to DAC. Could I hear any difference in the soundstage, timbre, and dynamics? I also connected the USB Isolator to my Styleaudio Carat-Peridot USB DAC. When driven by the Intona Isolator something a bit mysterious happened. This combination created a much more interesting soundstage, with detail and enhanced distinction among parts - more punch on drums and greater depth in the stereo image. Oddly, too, is that the green LEDs on the Isolator still flash, although I had understood that the Industrial model is designed to not do that. You really don’t need the visual austerity of this functional box in your system, but I reckon you should do yourself a big favour and get an Intona USB Isolator in your system, hidden away (especially because the green LEDs flash distractingly), and presenting your music files with dynamics, clarity, and musicality. As an old UK television advert for decking paint once said, it does exactly what it says on the tin! Yes, I’ve got strong reservation about the aesthetics of the mechanical packaging of this unit, and no, I can’t tell you why it makes my recorded music sound especially great. But I can tell you that it does present something audibly special, and that is what it’s all about, isn’t it? The extent of the effect will depend on how ‘dirty’ the USB signal is in a system, and the safety effects will not normally be necessary in a domestic setup. I extend my appreciation to Daniel Staemmler, CEO of Intona Technology, for promptly providing a sample for review. Sonically, I was very satisfied with the performance of the Isolator, and had only reservations about the case colour and LED blinking. Since my review was written, I have been provided with an updated industrial unit in a black case, which is now an option. Two updates have been introduced. The LED NoFlash option has been merged to the standard firmware. The Isolator now shows the connection state by blinking. After three seconds, both LEDs will be constantly on. This can be seen as a “locked” state. All currently sold units have the NF option on by default. Intona have swapped the “high-speed” indication with the “failure” indication. In addition, previously the Isolator was limited to Full Speed (12 MBit/s) and Low Speed (1.5 MBit/s) transmission. This new product is capable of transmitting USB 2.0 Hi-Speed (480 MBit/s) while providing full galvanic isolation of both the data and the power lines. I have used the new version for several weeks and can report that the new Isolator fully addresses my concerns about effect and appearance. In use the Isolator is delivering noticeably quieter signal and this has opened up the sound dynamics, which I am much enjoying. In a black case, it is also more pleasingly discrete in appearance.